The Milton fold-and-mails are delightfully whimsical. I forgot to take a photo of the front of this one. 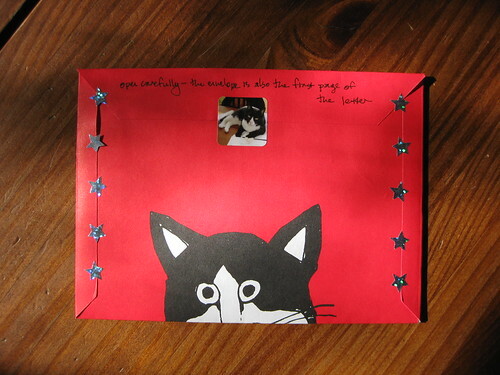 The top flap seal is assisted by a Moo sticker of my cat Soda helping me to write a letter. 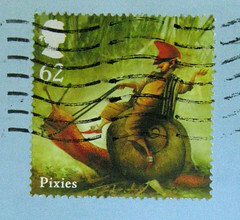 And I have my customary warning on the back, for those who might not have encountered fold-and-mail goodness. I really like looking at the fold and mails, but for some reason I never use them myself. I don't know why but I just have a hard time getting excited about them... I love ENVELOPES! Is that weird? I'm a weirdo. I guess for me I just like envelopes that are pretty and highly decorated - and I get that with a fold-and-mail. I hear you, there's a big part of me that prefers to pull the letter part out of the envelope part... but I almost always write additional pages that get inserted INTO the fold-and-mails, so that halfway mitigates it.